Last week when my girls were playing in the pool, I sat on the deck watching them while sipping a glass of iced tea and crocheting. It was really lovely to sit outside and crochet - gosh how I have missed that, I must make a point of doing this regularly over the summer months ahead, it is really quite soothing and relaxing. What was I working on you ask? Well this little guy. 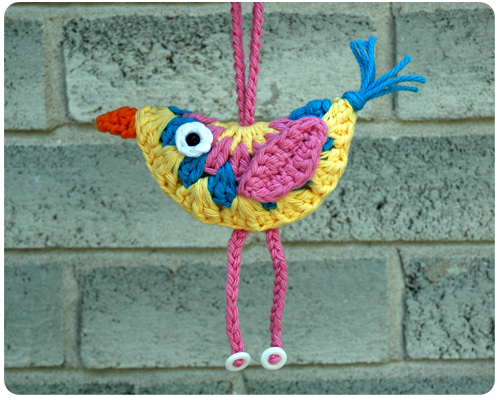 The pattern is from Bunny Mummy, the same place where I got the pattern for my crochet owl. I made a few changes to her pattern - I crocheted the wings and beak rather than using felt, simply because I did not have the right colors of felt on hand and did not want to trek all the way to the store - but otherwise I followed her beautifully photographed tutorial. The yarn is from my stash of course - Bernat Handicrafter Cotton. He's cute isn't he? And so simple to make. I got all the pieces crocheted in that one afternoon on the deck, and then assembled him after dinner. I love little projects like these, such a sense of satisfaction from starting and finishing something rather quickly. Leslie, great idea to use this bird as a Christmas ornament. Something to think about for next Christmas for sure. Thanks for stopping by. What a cute bird .. I love all the colors you used! Thank you Jeannie. Creating a bird with a doilee is a great idea. Thanks for reading. So cute! I really like the color combination! Thank you. I am trying to use up some of the cotton that I have and am having a lot of fun combining different colors together. Thanks for stopping by.